Mustafa Shah studied for his BA in Arabic with Linguistics at SOAS. He later completed his PhD in Islamic Studies with a thesis entitled Religious Orthodoxy and the Development of Arabic Linguistic Thought in 1997. He was appointed a lecturer in Islamic Studies at SOAS in 2002, having previously taught in the Department of Religions and the Near and Middle East Department. He is the editor of Tafsir : Interpreting the Qur’an (Routledge, 2012) and The Hadith : Articulating the Beliefs and Constructs of Classical Islam (Routledge, 2009). M. A. S. Abdel Haleem was born in Egypt, and learned the Qur’an by heart from childhood. Educated at al-Azhar, Cairo, and Cambridge Universities, he has taught Arabic and Islamic Studies at Cambridge and London Universities since 1966, including courses in advanced translation and the Qur’an. He is now Professor of Islamic Studies at the School of Oriental and African Studies, University of London. His publications include Understanding the Qur’an : Themes and Style (I. B. Tauris, 2010) and Sharia and the Concept of Benefit : The Use and Function of Maslaha in Islamic Jurisprudence (I. B. Tauris, 2015). The Qur’an is the foundational sacred text of the Islamic faith. Traditionally revered as the literal word of God, its pronouncements and discussions form the bedrock of Islamic beliefs and teachings. Notwithstanding its religious pre-eminence and the fact that it is the sacred text for over one billion of the world’s Muslims, the Qur’an is also considered to be the matchless masterpiece of the Arabic language. Its historical impact as a text can be discerned in all aspects of the heritage of the Arabic literary tradition. Over recent decades, academic engagement with the Qur’an has produced an impressive array of scholarship, ranging from detailed studies of the text’s unique language, style and structure, to meticulous surveys of its contents, concepts and historical contexts. 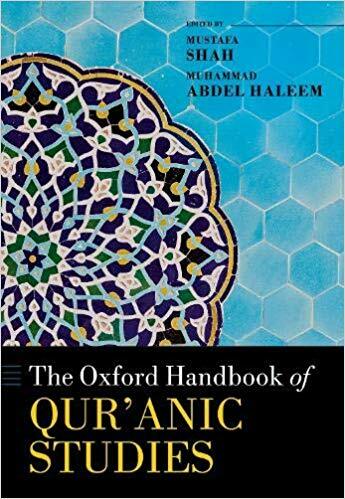 The Oxford Handbook of Qur’anic Studies is an essential reference and starting point for those with an academic interest in the Qur’an. It offers not only detailed reviews of influential subjects in the field, but also a critical overview of developments in the research discourse. It explores the tradition of Qur’anic exegesis and hermeneutics, making it a comprehensive academic resource for the study of the Qur’an. No single volume devoted to such a broad academic survey of the state of the field currently exists.